$950 per person double occupancy including, two nights’ accommodation, all trip-related guides, admissions and transportation and one dinner. Single Supplement $250 Does not include airfare or alcoholic beverages except where specified in the itinerary. Please scroll down for optional Sunday excursions to Greenfield Village in Dearborn or Cranbrook Estate and Art Museum in Bloomfield Hills. Trip begins at 11:00 a.m. Walking Tour of Center City, including the iconic Guardian Building, the Book Tower, Capitol Park, Campus Martius, and Cadillac Square. Tour may explore the 1897-1902 Wayne County Building – recently restored by Christman Company. Who doesn’t love a good train station and what we have here is a very good one indeed, magnificent in its restored and working glory and considered by many to be the grandest station in the country. A one point in its long struggle to rebuild, the city came dangerously close to selling off DIA’s world class collections. Wiser heads prevailed and this late afternoon we pay tribute to the mighty workers at the heart of this city’s great story as depicted in the incomparable murals of Diego Riviera. And then drinks are on us. We get a taste of Detroit’s lively new cultural scene when we stick around for DIA’s Music in Atrium. Have a round--or two--of drinks on us before heading off to dinner on your own. We head out to Grosse Pointe to experience the high life as lived by the scion of the Ford family. Inspired by the couple’s travels in the Cotswolds and designed by Detorit architect Albert Kahn, this was the family’s home from 1929 until Eleanor’s death in 1976 when it was left as a gift to the people of Michigan. The estate continues to be as noted for its gardens and art collection as it is for its stunning manor house. The strong influence of the Arts and Crafts Movement has been felt from the beginning of the justly famous Pewabic Tiles. We tour the tile works and learn more of its story, one that is thoroughly intertwined with that of the city’s and evidence of which is seen everywhere. Now 30 years old, the Heidelberg Project is the vision of one man, Tyree Guyton, who decided to use the very bones of his neighborhood to make an artistic statement and bring new life back to the area. From a modest house sprang an empire and with it yet another facet of Detroit’s story. This evening we dine in style and as guest members at The Detroit Athletic Club. 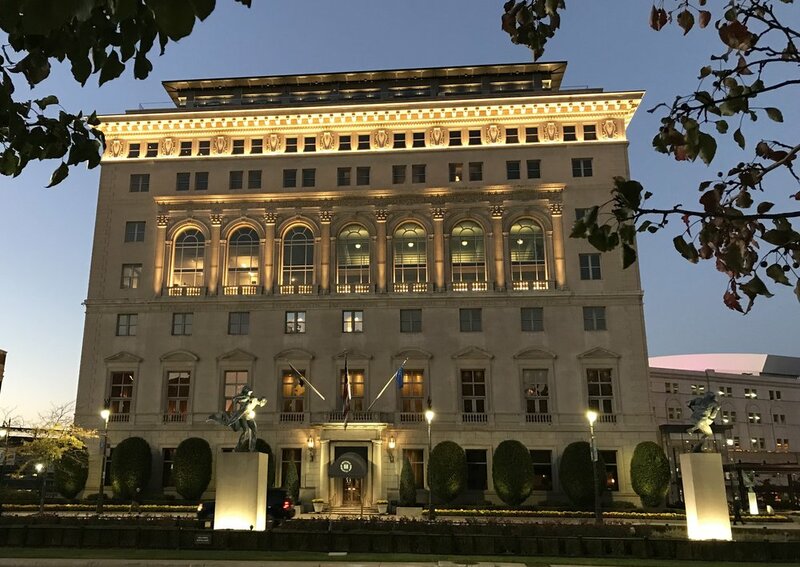 DAC, as it is affectionately known, is yet another one of Detroit’s iconic architectural gems, a neoclassical beauty modeled on Rome’s Palazzo Farnese. Cost of both options to be determined by the number of participants. …and if time permits we squeeze in one more bit of fun—a swing by at Fair Lane, the estate of Clara and Henry Ford. A full day visit to Cranbrook House and Gardens and Cranbrook Art Museum. The house and gardens are the former home of George and Ellen Booth, heirs to the Scripps Publishing empire. The Booths were visionary supporters of the Arts and Crafts Movement, as evidenced throughout the house by outstanding examples of personally commissioned works and the ethos of which became the inspiration for Cranbrook Academy of Art. The renowned Cranbrook Art Museum has important collections of contemporary art, fine crafts, design and architecture--a particular stand out of which is the complete Saarinen House, a Modernist masterpiece.